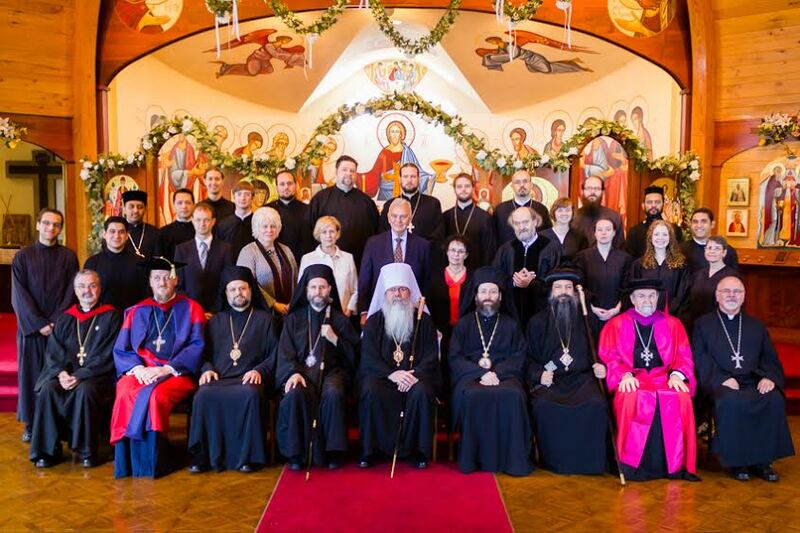 Over three dozen individuals were honored at commencement ceremonies at the Orthodox Church in America’s three seminaries during the month of May 2014. On the second weeked of May, Saint Herman’s Seminary, Kodiak, AK, honored and celebrated the ordinations of three graduates—Priests Simeon Askoak and Jason Isaac and Deacon Michael Trefon. Three additional students—Luke Levi, Mary Madsen and Alexander Larson—were awarded Reader Certificates. His Grace, Bishop David of Sitka and Alaska, delivered the commencement address, while Archimandrite Juvenaly [Repass], the seminary’s Chaplain, offered a special reflection on his six years of ministry at the school. He will be leaving soon to pursue mission work. A number of other alumni were also present, including Archpriests Nicolai Isaac and Thomas Andrew and Priest Michael Fredericks. Two weeks later, on Saturday, May 24, Saint Tikhon’s Seminary, South Canaan, PA held its 72nd annual commencement exercises during the 110th Pilgrimage to Saint Tikhon’s Monastery. Nine individuals were awarded the Master of Divinity Degree—two with Honors in Liturgical Arts and Praxis and one with Honors in Church History—while an additional six individuals were awarded the Certificate in Diaconal Formation. The day opened with the celebration of the Divine Liturgy by His Grace, Bishop Michael of New York and New Jersey and Seminary Rector, and His Grace, Bishop David of Sitka and Diocese of Alaska. 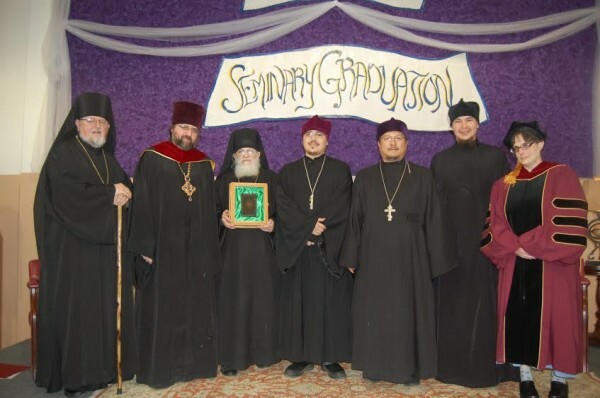 Among the concelebrants was Archpriest Chad Hatfield, Chancellor of Saint Vladimir’s Seminary, who stayed for the commencement and accompanied the Saint Tikhon faculty in the graduation procession. Bishop David offered the homily, in which he reflected on the early Alaskan missionaries. Following brunch and a procession from the seminary building to the monastery bell tower, commencement exercises began with His Beatitude, Metropolitan Tikhon, offering the opening prayer. Bishop Michael then remembered Archpriest Alexander Atty, former Seminary Dean, who fell asleep in the Lord in March 2014. Dr. Eli Stavisky, who recently had been granted Emeritus Board Member status, was awarded an Honorary Doctorate in Humane Letters in recognition of his 30 years of service—the longest of any trustee member to date. As Board Vice-Chair since the position was created, he was an integral part of the initial approach to accreditation with the Association of Theological Schools. He served the community in numerous other ways, ranging from offering dental care to students and their families to serving as an active liaison of the Board with members of the faculty. Following his daughter’s untimely death 10 years ago, he had established a scholarship in her name. The Commencement Address was delivered by His Grace, Bishop Sava, retired Bishop of Slavonia. His Grace attended Vespers at one of the churches at which the seminary’s Mission Choir had sung during Great Lent. From that moment, he was encouraged by Archpriest Steven Voytovich, Seminary Dean, to return to Saint Tikhon’s after having been part of the monastery and seminary communities 50 years ago. In his heartfelt address, Bishop Sava related the many reasons he had given the late Patriarch Pavle as to why he should not be consecrated to the episcopacy. On their numerous subsequent visits, Patriarch Pavle shared with Bishop Sava the many difficulties he too had to face in his ministry as Patriarch, admitting in the midst of them that he too did not seek to be elevated to the rank of Patriarch. Bishop Sava’s comments and stories offered a wonderful lens from which the new graduates could draw as they begin their ministries in like manner as humble servant clergy and dedicated laypersons. Metropolitan Tikhon offered his own concluding remarks, sharing remembrances of ancestral family members serving in the Revolutionary War that brought Matthew 25 to life for many in the midst of their own trying circumstances. Finally, Archpriest Theodore Boback welcomed the graduates as members of the Saint Tikhon Alumni Association. 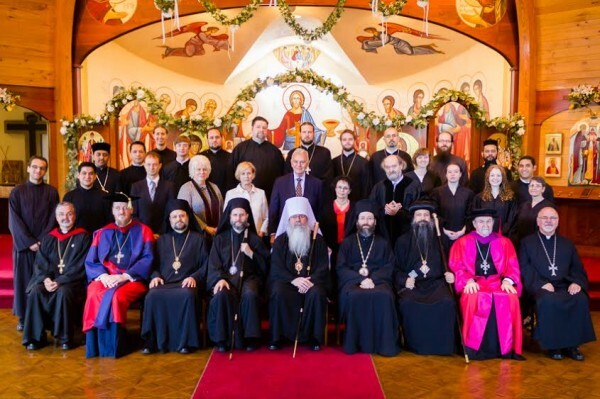 Metropolitan Tikhon also presided at commencement exercises at Saint Vladimir’s Seminary, Yonkers, NY on Saturday, May 31, during which 21 graduates were honored. Eight students were awarded Master of Divinity degrees, while four received Master of Theology degrees and nine were awarded Master of Arts degrees. Priests Nicholas Eric Roth and Kyle Parrott served as Valedictorians, while Seminarians John Bradley Vien and Luke Bullock served as Salutatorians. 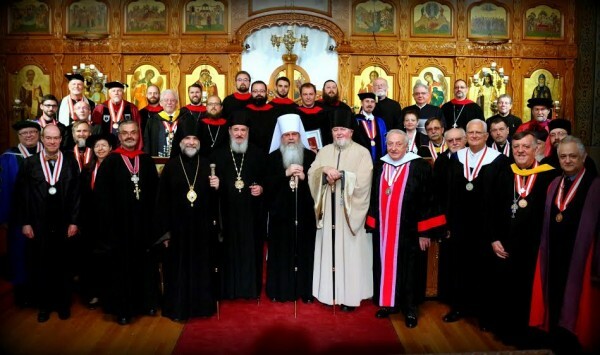 Also in attendance were His Eminence, Metropolitan Silouan of Buenos Aires for His Beatitude, Patriach John X of Antioch and All the East for the Antiochian Orthodox Christian Archdiocese of North America; His Grace, Bishop David of the Coptic Orthodox Diocese of New York and New England; His Grace Nicholas, Auxiliary Bishop for Brooklyn of the Antiochian Archdiocese; Archpriest Steven Voytovich, Dean of Saint Tikhon’s Seminary, South Canaan, PA; and Archpriest Mardiros Chevian, Dean of Saint Nersess Armenian Theological Seminary, Armonk, NY. This year’s Saint Macrina Award for Excellence in Teaching went to Dr. Paul Meyendorff, the Father Alexander Schmemann Professor of Liturgical Theology at Saint Vladimir’s Seminary. As well, Archpriest John Behr, Dean, read a special resolution from the Board of Trustees with regard to the retirement of seminary professor Archpriest Paul Nadim Tarazi, recognizing his 40 years of dedicated service to his students and thanking him for his unwavering commitment to Jesus Christ and His Holy Church. Father Paul, a priest in the Antiochian Orthodox Christian Archdiocese, taught Old Testament and Biblical Studies to a generation of seminarians. The Board of Trustees also awarded an honorary Doctor of Sacred Music degree to Estonian composer Arvo Part. The Consul General of Estonia, Sten Schwede; the Honorable Urve Tiidus, Estonian Minister of Culture; and Her Excellency, Marina Kaljurand, Estonian Ambassador to the US, attended the academic ceremony. Mr. Pärt was the guest of honor at a Carnegie Hall concert that same evening, sponsored by the Arvo Part Project at Saint Vladimir’s Seminary and featuring his music, performed by the Estonian Philharmonic Chamber Choir and the Tallinn Chamber Orchestra and conducted by Tõnu Kaljuste. After the Commencement Exercises, Mr. Pärt and his wife, Nora, were honored by the Saint Vladimir’s Seminary Children’s Choir, directed by Khouria Danielle Miller. The choir sang Vespers with music especially arranged for them by composer Ivan Moody. The children’s choir will be publishing a recording of the vespers in fall 2014.